Photographed along Mesquite Wash, Maricopa Co., Arizona. May 10, 2008. A higher resolution image has been uploaded to Wikimedia. ANNUAL: Spring herbaceous annual becoming apparent after many other spring annuals have withered. Upright, about 30 cm or less and freely branched. 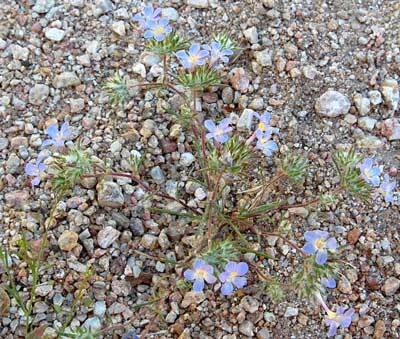 FLOWERS: Blue, five pointed stars clustered together and subtended by many, fuzzy bracts; style branches usu. three. The petals are of slightly different sizes making the flowers bilaterally symemtric. Blooming mid to late spring. LEAVES: Alternate leaves are divided into very narrow lobes. RANGE: Frequent throughout the Sonoran Desert in Arizona and Mexico, also ranging into the Mojave Desert westwards on rocky slopes, desert flats and along sandy washes. Not apparent in years when the winter-spring rainy season fails. FRUIT: Dry capsule with several seeds. UNARMED. No thorns, but dried leaves and floral bracts can be a little sharp.